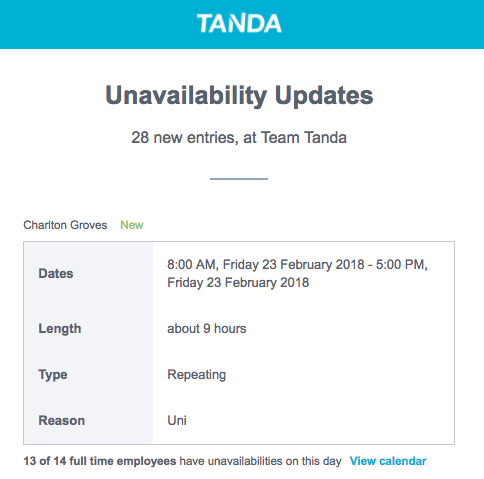 Unavailability in Tanda has received a number of improvements over the last few months, in this article we detail what these are as well as the process to turn on this feature for employees. Unavailability Updates via Email: Managers and admins will now receive an email listing all new or updated unavailability entries from staff. This means you can keep track of staff unavailability and easily click through to see the entire calendar. 2. Staff can now enter unavailability via our new mobile app: We recently released a mobile app which your staff can use to check their roster, enter unavailability (when turned on) and apply for leave. The app makes it much easier than before to enter unavailability, especially when it is repeating / recurring. 3. You can set a minimum number of days notice required: If you want to make sure staff give you adequate notice before entering their unavailability you can set a minimum number of days notice in settings. When entering unavailability, staff will get a warning and won't be able to enter it if it is within the minimum number of days required. Note: the admin on your account will need to turn this on.